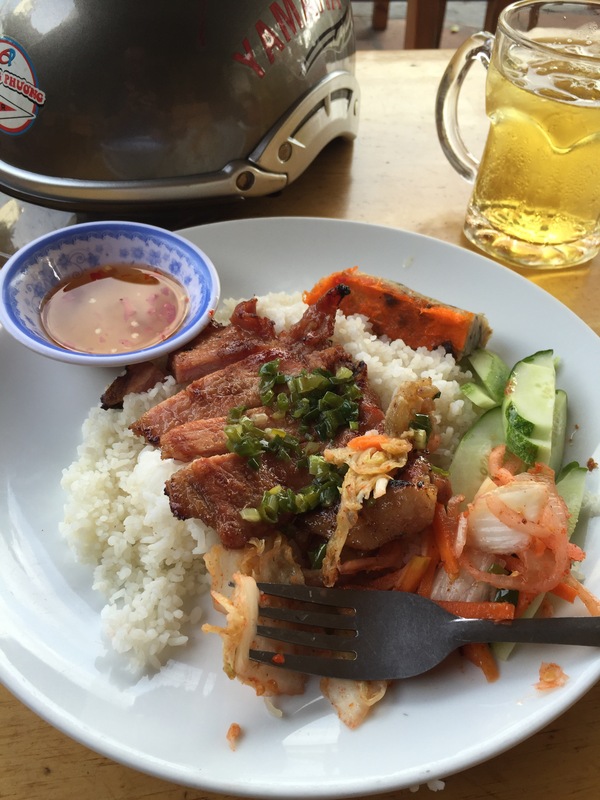 One can find no better place than Ho Chi Minh city to live frugally and deliciously at the same time. I am reminded of the recent articles that have been written about the recently anointed cheapest Michelin restaurant in the world, in Singapore. Well, I’m convinced Saigon has more than a few little Michelin places in these street joints if the people from that company would only tread their way to the side streets and alleyways of the city. The potential is always there. Regardless, here are a few cheap dining options in the city that I’ve enjoyed so far. This is a Cua (crab) place in district 3 that my cousin Tri, his friend Anthony, and I stumbled upon by accident – we were driving and just saw a big sign advertising a special deal on crabs for that day. Converted from a former club or beer place for higher ups, the toilet is the poshest I’ve seen, fully air conditioned, with clean, rich white tiles, a couch on the side, with the toilet seats clean and comfortable to rest one’s tush upon. As the actual eating space is outdoors, and it was a hot afternoon, I took to staying a little longer than was necessary to refresh myself. We were there on a Tuesday, when they had a special deal on already cheap crab prices. 45K Dong per crab, or 2USD. 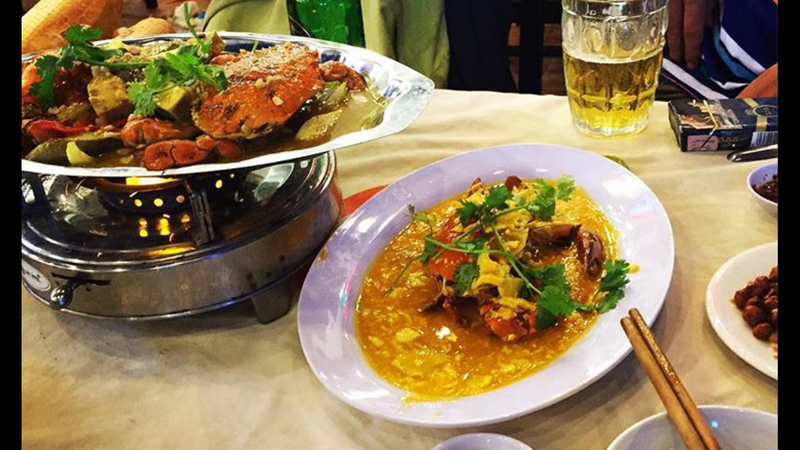 There are four flavours of crab marinades, each of them delicious in their own way. The beers also run cheap at 50 cents each. We ordered a crab each and loaded up on beers for the rest of the afternoon, drinking and talking about Vietnam and what we all were doing here. The crabs were rich in flavor, not overly steamed and great to suckle upon, and the iced beers a nice accompaniment on a hot afternoon. About four hours, a lot of laughter and two long visits to the posh bathroom for me later, the total bill came out to something like 4.50 USD per person – mathematicians amongst us can work out how many beers we had from the figure. Just yesterday, I was driving my bike on the road to The Factory to hear an artist’s talk (Bui Cong Khanh) when I realized I was a little early to the event, and starving. A side street chef working the grill outside beckoned me in and I stopped by for a quick lunch. One can’t appreciate art when hungry. Com tam suong is one of those sweet savory flavored grilled meat dishes that I so loved as a kid and sorely missed in America. The pork chop is marinaded in sweet fish sauce and soy sauce, the rice is broken, and layers of scallions usually garnish the top. It’s a simple and delicious dish and often accompanied with a little bowl of leafy soup and an egg meatloaf or shredded pork skin, or even an egg. It just depends on how much you’d like to add to your basic pork chop plating. I had two glasses of iced tea as I was thirsty from the long motorbike ride. The pork chop was delicious, sweet, tender, and the broken rice tempered the sweetness just right. Bill: 1.10 USD for pork chop and soup. 20 cents for two glasses of iced tea. 1.30 USD total. This cafe, with its tiny wooden fold up chairs and tables, is situated right outside my apartment in district 4, so I’ve hit it up for breakfast or lunch just about every other day. During the daytime its guests turn to face the river and Ben Van Don to watch the morning or afternoon traffic. At night chairs face the other way and everyone watches Premier League, or some other important football matches playing on the screen inside its narrow room. I love the name of this place. It’s called “cafe com me nau”, which translates literally to “Cafe Mother’s Cooked Rice”, or “Mother’s Rice Dishes Cafe”. I haven’t asked Bao, the friendly young waiter who looks about college age, if the chief chef is indeed his mother (or everyone’s mother, as it seemed like a family run operation), as I don’t know him that well yet. I do know this: the food that mama cooks is delicious. The Bo Luc Lac (shaking beef) is superb, with delicate, tender slices well marinaded, and the Mi Xao Bo contains generous slices of fresh tomatoes that blends well with the tenderness of the fried noodles and thin sliced beef that’s cooked just right. The Vietnamese iced coffee here is also priced nicely at 63 cents a glass. You get a nice street level view of the river that borders district 1, and endless glasses of iced tea refills for free. 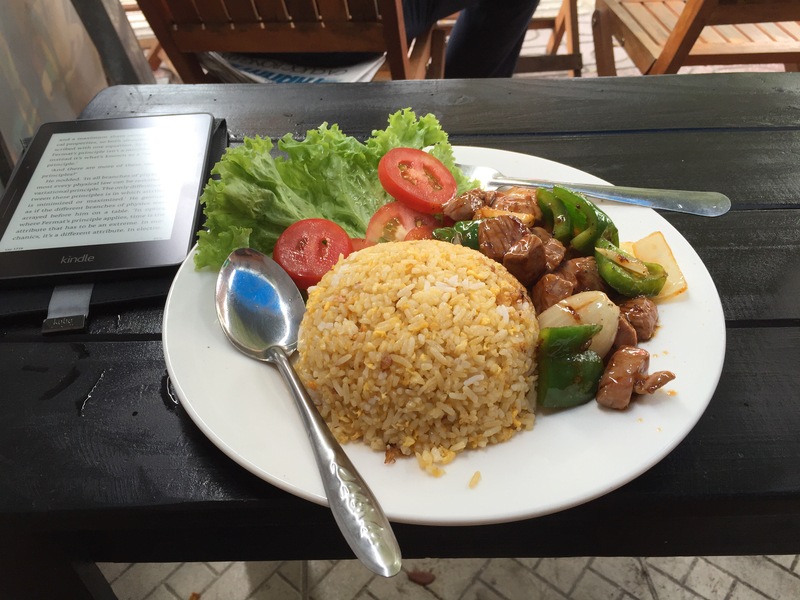 Bill: 1.90 USD for fried rice with shaken beef, 63 cents for iced coffee. 2.53 USD total. What’s the address of cafe com me nấu? hey Phuong – got your email. It’s right before 331 Ben Van Don going in a one way street, so it’s probably 333 – 338 Ben Van Don or so. You’ll see three places selling coffee and breakfast, and Com Me Nau is the one in the middle. The others are ok too.